This pishalal (Tzotzil Mayan for a man’s wide-brimmed hat) was purchased in 1977 by the Science Museum of Minnesota. It was bought from the Vasquez family of Navenchuac, a small village in the municipality of Zinacantan, in the state of Chiapas of extreme southern Mexico. The hat is made of white and black plastic strips, long multi-colored satin ribbons tied at the crown, and a leather chinstrap. Looking good: Two Maya men show the look of their pishalals.Courtesy Justin LockeFor all cultures, clothing can signify our multiple identities to others. For example, different types of clothing can tell others your gender identity or status within a community. In the highlands of Chiapas, Mexico, different Maya communities have distinct styles of dress and patterns that are exclusively from that community. A combination of these stylistic markers signify whether they are from within or from outside the community. They also indicate gender identity. Among the Tzotzil speaking Maya communities of the Zinacantan region (also known as Zinacantecos), women make the majority of clothing within the community, but men make and wear these hats.. Today Zinacanteco men mainly wear these hats for special occasions, namely the fiestas of San Lorenzo and San Sebastian in August and January. The pishalal accompanies short pants of woven cotton, a red and green wool sash and a short pull-over shirt, a chamarra (similar to a poncho) over the shirt and kerchief about the neck. Other items are added for special occasions that relate to an individuals various ceremonial statuses. Is this an “authentic” Maya hat? Making a hat: A Maya man starts the process of making a pishalal.Courtesy SMM Education Dept. 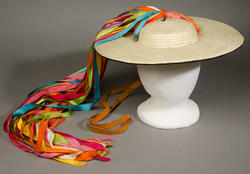 Although this hat is made out of synthetic materials, it is authentic to the Zinacantecos. It continues a centuries-old practice of incorporating new materials and ideas into their own aesthetic and artistic traditions. 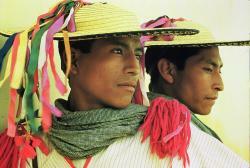 The Zinacantecos are not isolated in the Chiapas highlands. For centuries, members of this community have influenced and been influenced by cultures from throughout the region and beyond. These complex interactions continue to shape who they are today. Prior to European contact, they controlled the only source of salt in the Chiapas Highlands. Zinacanteco merchants traded the salt for amber, cacao, and quetzal feathers from the Chiapas lowlands, which they then sold to the Aztec traders who came from central Mexico. These interactions influenced the design and materials used in their clothing. Contact with the Spanish greatly influenced men's costume. Some of the clothing worn by community religious officials today is similar to 16th Century Spanish clothing and perhaps this hat style has Spanish influence as well. Some types of clothing demonstrate a continuity of pre-Columbian clothing while others are a combination of both. The long streams of ribbon that are a part of this hat may be a contemporary replacement for the long colorful feathers worn by their ancestors. Maya men also began using plastic in the place of palm strips. This replacement of a natural material for a synthetic material is similar to the replacement of feathers for ribbons. Hat in progress: Hat makers roll together two strips of plastic to make the brim of a pishalal.Courtesy SMMMaking a pishalal begins by acquiring the palm strips of plastic from a local merchant. Braiding the plastic or palm strips is time consuming, but very portable. It can be done almost any time and anywhere and men often take the hat with them on trips or while talking with friends and community members. Once the braiding is finished, some men sew their own hats, but generally the strips are taken to a hat-sewer (hts’is pishalal) who coils and sews the braided strips into the shape of the hat. Upon completion, they buy the multicolored ribbons (shelail pishalal) that are placed on the top of the hat and finally add the leather strap (kamosa) to hold the hat on their head. Men are constantly working on their hats and often make two new ones each year for the fiestas of San Lorenzo and San Sebastian. 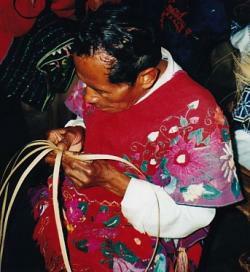 In the image below, a contemporary Zinacanteco man is beginning the process of making the top of the hat by evenly spacing wide strips of palm. 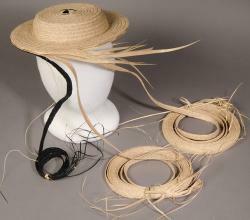 Thinner strips of palm can be seen to the right that will be used for the braiding of the rest of the hat. Also notice the bright, colorful and floral designs of his chamarra. Here's your chance to be a museum label writer. Click the button below to write your own description of this unique item. What is really important about this item that other people should know? Just don't write "I think it's cool!"